It’s easy to fall in love with fennel at first bite. Its crisp, crunchy texture and aromatic taste have endeared it to my kitchen for a lifetime. Fennel has the distinct ability to leave you feeling fresh and has been used for centuries as a digestive remedy. Science has shown us it is an anti-inflammatory, analgesic, carminative, diuretic and antispasmodic agent. It is also known for its antimicrobial activity – most likely is due to the presence of different active phyto-compounds. While you might find that it tastes like licorice crossed with celery, it is, in fact, sweeter and juicier than celery. I don't find it to have an overwhelming licorice flavour; just a hint that mellows completely when cooked. At only 28 calories per cup and with good amounts of Vitamins A, B and C, fennel may become your new best friend from the produce department. 1. Fennel relieves digestive upset and colic in babies. 2. Fennel can combat symptoms of PMS. Like many other herbs, fennel has diuretic properties which will not deplete your body of potassium (a much-needed electrolyte instrumental in cardiac health).3 The diuretic properties of fennel can relieve PMS symptoms, such as bloating, cramping and general edema, without any side effects. 3. Fennel, if consumed during pregnancy, may guard against heart disease for your baby later in life. Fennel contains dietary isoflavones that are similar to a soybean's phytoestrogens. These isoflavones have been shown (in animal studies) to reduce a baby’s risk of heart disease later in life if consumed by the mother during pregnancy.4 Keep eating that fennel after the baby is born! 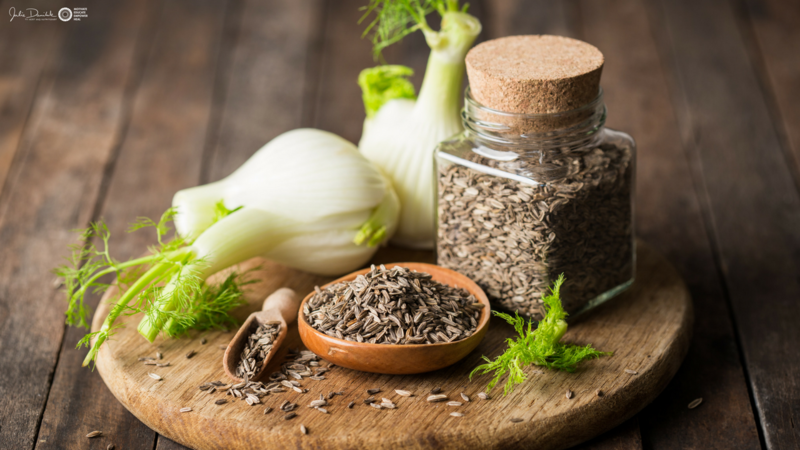 Fennel acts as a galactagogue by increasing the production of breast milk from the mammary glands. 4. Fennel is a high potency antioxidant. Fennel is not usually on the top of the list when antioxidants come to mind, yet this incredible herb is packed with alpha-tocopherol (Vitamin E) which mops up all of those disease-causing free radicals.5 Stock up on fennel to boost your immunity for every cold and flu season! 5. Fennel can help combat the toxic effects of chemotherapy.